How do I pay? You will be contacted in 2-3 weeks with a link to a secure pay-portal. This will enable you to pay by credit card if you did not enclose a check with your sample submission. Checks can be made out to Cornell University. How do I know that my samples arrived safely? 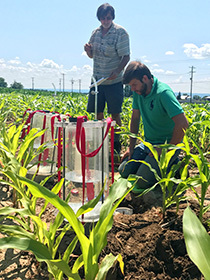 You will not automatically receive a confirmation that we received your samples, however if you wish to email (soilhealth@cornell.edu) and ask to receive a confirmation we can let you know when they arrive.